103.23920 Craftsman Shaper Table/King-Seeley Mfg. Tough, Sturdy, Good Ol' Quality Cast Iron Machine. Would like to Restore it someday to it's Original New Condition if I ever find the 2 Missing Parts I need. But may end up Having those Machined. I have a Copy of the Original Owners Manual, If anyone else has a Machine like this one. Comments for 103.23920 Craftsman Shaper Table/King-Seeley Mfg. 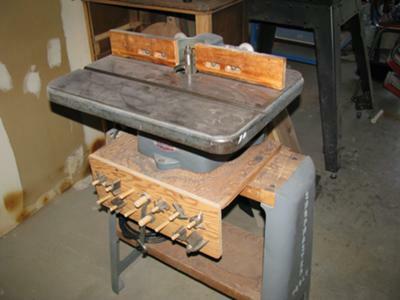 I recently became the proud owner of a 103.23920 Craftsman Shaper Table/King-Seely. I would like to acquire an owners manual if possible. It's in good shape but I feel I couldn't do it any justice if I don't know how to properly use it! Thanks for your help! I also have a manual for Model 103.23921. It has less detail about how to operate it, but does include an exploded view and parts list. It looks like this is a popular manual. I hope that I too could get a copy. I just got the machine and would really like to take care of and use it properly. Please send me a copy, to:eugenemueller@yahoo.com. Thank you very much!! I reversed the motor on my shaper by opening the cover plate on the bottom of the motor and reversing some wires. If I remember right, it's marked so you can tell what to do. As far as the noisy spindle goes, you may need to disassemble it and clean and lubricate the bearings. I just acquired a Model 103.23920 shaper. The spindle seems a little noisy. Could this be a bearing in need of lubrication? Can the motor be reversed? Looking down on the spindle, it spins clockwise. I would prefer it spend counter-clockwise. How could I obtain a copy of the manual? Many thanks. I have model 103.23921 - from my Dad's shop. It looks the same as yours. He used it a lot to make cabinet doors back in the 50's and 60's as a contractor. I have cleaned and refurbished it and it runs well. The spindle is worn where the sheave is attached, and I'm wondering if a new one can be found. I am interested in getting a copy of your manual. can give me I will appreciate. I didn't even know what it was until I looked at this web site. I have just acquired a model 103.23921. I don't know how different the two models are, but I am interested in restoring and using this shaper to its full potential also. I would like to get a copy of your manual if possible.